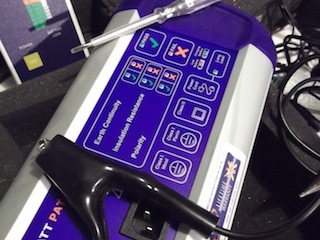 The Portable Appliance Testing (PAT) scheme was launched by the Consortium in late autumn 2011. It aims to provide a cost effective scheme for testing the electrical appliances of our members’ halls. Currently over 40 venues annually benefit from the scheme and, as a result, about 1000 appliances are undergoing a regular safety check. We have a team of 10 trained volunteer testers who are key to the scheme and give their time freely. Portable Appliance Testing is a health and safety measure. This applies to all portable appliances used in halls irrespective of whether they are owned by the hall or its users. It is best practice and many insurance companies require it. Members should consider it for these reasons and for the protection of your Management Committees. Here is a summary describing the service. For further details contact the Secretary, George Courtice. for 31 or more appliances, £1 per appliance. The scheme is intended to be self-funding. The revenue earned from it goes to cover items like: insurance, annual recalibration, replacement of test kits, volunteer testers’ training and mileage. No VAT is charged and the price includes travel costs for the volunteer testers.